Being a mountain girl at heart, I was expecting never ending sandy desert - boy, was I wrong! Morocco – More than just rolling miles of sand! When I was first offered the chance to join a horse riding holiday in Morocco I didn’t think it would be ‘my bag’. Now, having returned from a fantastic time, I wonder what it was I thought my ‘bag’ was! My adventure in a remote country with dramatic scenery, a people steeped in culture, the High Andes Mountains appealing to my ‘mountain girl’ spirit, and beaches, all coupled with a great horse, are exactly the things I love! My initial perception of Morocco had been a desert with sand, sand and more sand. How wrong I had been. Our Essaouira Beach Trail started with an overnight stay in Marrakech, and my introduction to some of the delicious Moroccan wines. During the bright and early morning transfer, I exchanged a few jokes with tour driver. It was a sharp reminder that I hardly remembered anything of my school-girl French and, having spent the last 4 holidays in Spanish speaking countries, I couldn’t stop myself saying ‘Si’ and ‘Gracias’ at every opportunity. But then I’m not famous for my language skills. Beach riding at its best! When we met the horses there was another surprise. I was aware it is customary to ride Stallions in Morocco. 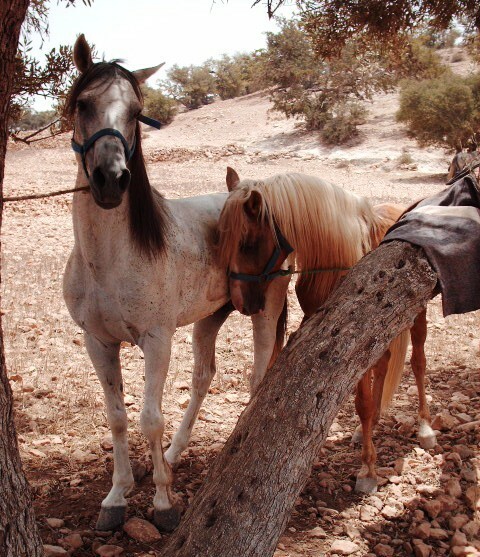 Moroccans don’t like to castrate horses and believe the mares are too precious to ride, rather a nice philosophy I think. The few stallions I have had exposure to in the past have been big brutes with classic thick necks, only too happy to use you as a snack between meals if you get too close to the stable door! The steeds awaiting us were Arab x Barb. I have a Welsh Cob gelding myself and, admittedly he might be on the porky side (holding a fair bit of the bulk in his crest to try and fool me into feeding him more). Naturally, I expected a thick crest but these lovely 15hh stallions looked very slim compared to my fat boy. No sign of the chunky neck I remembered being so startled by in the past. My little black stallion named Eder, after the famous Albanian artist, had a beautifully tempered nature and was a pleasure to groom and tack up. Rather than nipping or biting, he nuzzled rather sweetly and rubbed his head on me, and also, surprisingly, on our guide, who I caught giving him an affectionate scratch. I suddenly felt quite nervous as we led all our allocated horses into a makeshift ‘test arena’. My riding abilities were in question, and unlike other occasions when I could remind myself how many years I had been riding, I really hadn’t ridden a stallion before and didn’t know what would happen. I had been told that riding stallions were quite different and you need to be aware of the potential of kicking matches. The guide took great care ensuring that we were all happy with our mounts and able control them which, despite my doubts, wasn’t hard. We set out, happily expecting to head onto the beach right next to us, but instead headed up a very steep rocky track which showed the amazing sure-footedness that these horses have. Only in the Americas have I ridden over ground this rough and steep on horseback. This level of incline would have meant us dismounting and leading our horses on some of the European horse riding holidays that I have been on. It was a surprise and a relief. We rode carefully in single file with good distance on the first day, as our guide instructed. The day of rock climbing ended with the arrival at a deserted beach cove where our horses paddled before we cantered along the golden sands. These horses were extremely fit and, even in this heat, didn’t break a sweat. I had fallen in love with Eder, and by now I’d booked his ticket home with me! One of the horses, Aniqa, had a quirk that made us all laugh. He rather fancied a donkey as a girlfriend, any donkey would do, which he expressed quite clearly at every available opportunity! He also loved being in the lead, so our guide let him and his rider to it one day. An unsuspecting local was passing on her donkey and Aniqa’s well-meaning rider gestured for her to move over as a preventative measure. Unfortunately the hand signals she used locally mean ‘go away’. The poor woman sheepishly said in Berber ‘But I live here’. We were mortified. Most days started on rocky tracks with cliff-top views and finishing on a beach. Beautiful sand, but no desert at all. It does seem I had misjudged Morocco, or at least this trail. We walked more each day than I had expected, but for the views and the village tracks well worth it. 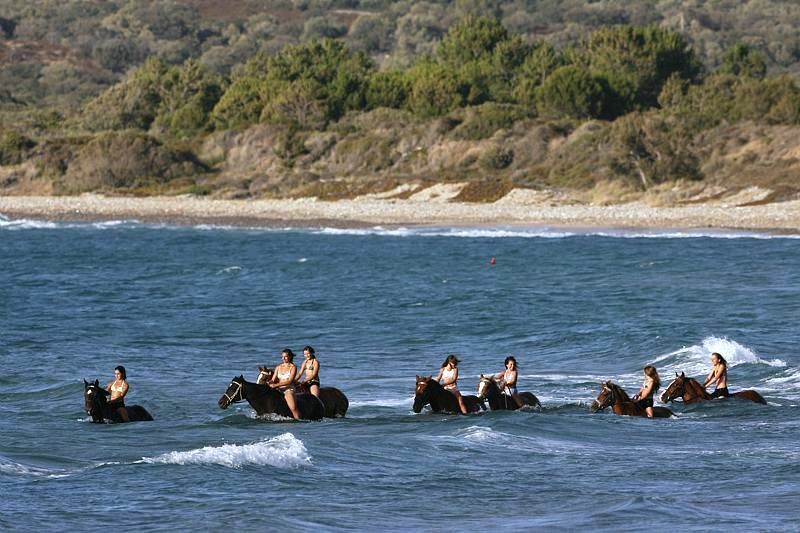 The beach canters got longer and faster each day until we were all galloping alongside each other by end of the week. I’m a child when it comes to adrenaline, and this was great fun. What also may have put me off previously was the aspect of camping, but I am now a convert to canvas. Apart from being able to stay in places that you normally wouldn’t be able to, you make friendships far quicker when you don’t have a hotel room to retire to. On this trail we reached some magnificent spots that wouldn’t have been possible without the benefit of a tent. The Moroccan backup team made our camping as comfortable as possible. I miss the delicious tagines almost as much as my black stallion Eder, and I truly hope to return to ride him again. Perhaps maybe he can teach me about the desert. One day I may surprise myself and develop a love for sand. 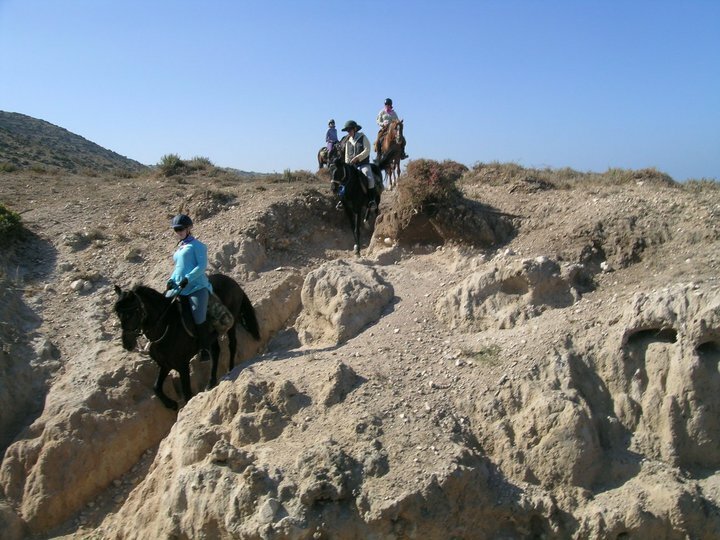 Although I really am really a mountain person at heart, I do hear that the desert is different every day, and can’t wait for my next horse riding holiday in Morocco. Adapted by Andrew Knapp from Sue Maling’s account of her horse riding holiday in Morocco for Unicorn Trails.